WHEN PLYMOUTH ROCK STUDIO, or “Hollywood East,” opens in Plymouth next year, the films made there will include blatant product placement advertising for Charles David Salon: Every time any cast member’s face or hair is on screen, you’ll be looking at the Hanover salon’s handiwork. Honeycutt notes that his salon sets high standards for its staff members. Each goes through an 18-month training program and then takes mandatory classes every other week. “I believe that our methods in educating and our community involvement were major factors in why we were chosen for Hollywood East,” Honeycutt says. The salon’s most recent community endeavor involved funding – along with Dana Farber and Brigham and Women’s Hospital – the South Shore Hospital Cancer Center in Weymouth, which is scheduled to open later this year. “It was a wonderful thing to see this level care in our backyards,” says Honeycutt, who is the only salon owner on the hospital’s board of trustees. The salon at Plymouth Rock Studios, which will provide round-the-clock hair and makeup services, will occupy a spacious, 5,000-square-foot studio next to a five-star hotel in Paramount Village. With Plymouth’s anticipated production roster of 17 films per year, the salon will certainly see its share of celebrities. “Most of the stars will have work such as coloring done in the salon, and then each set will have a couple of chairs and a makeup area,” says Honeycutt. “This transition will be interesting but also something that we’ll do well. 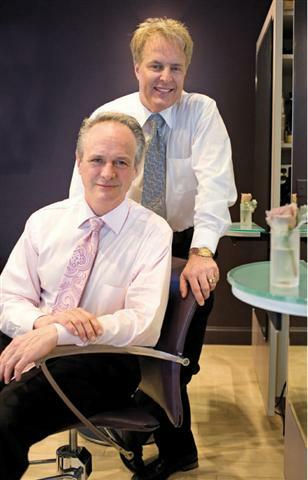 We have two years to get it down.” And although Charles David will be taking on new VIP clients, Honeycutt promises that loyal customers will have the same access to hairdressers and receive the same standard of care as the celebrities. The original Charles David Salon opened 13 years ago in Norwell with only four employees. Last February the business moved to a new, two-floor, 7,800-square-foot location on Webster Street in Hanover. The new digs are staffed by 84 employees and include a full spa, a café, a clothing store, and an interior design shop. Charles David Salon, 222 Webster Street, Hanover, 781-982-1224; charlesdavidsalon.com.